A few months back while having lunch with my friend Bryan I found out that he is a big fan of the Star Trek series and over the years had gathered quite an impressive collection of Star Trek memorabilia. When I learned of a new movie coming to the theaters today I ask Bryan if we could do something special to post on my blog. So... Are you Star Trek ready? Photo props are courtesy of Bryan, except the cake. In the beginning, Star Trek took us on a galactic journey with Captain Kirk in command of the Starship Enterprise NCC-1701. The original television series began in 1966 and ran for three seasons. Its mission was to seek out other life forms and civilizations, and Russian cheesecake recipes. Also, the original cast was featured in 22 animated episodes in the mid 70's, and six movies between 1979 and 1991. The second television series in the Star Trek universe brought us a new ship and crew, and took place on the Enterprise NCC-1701D over 150 years after the original series timeline. 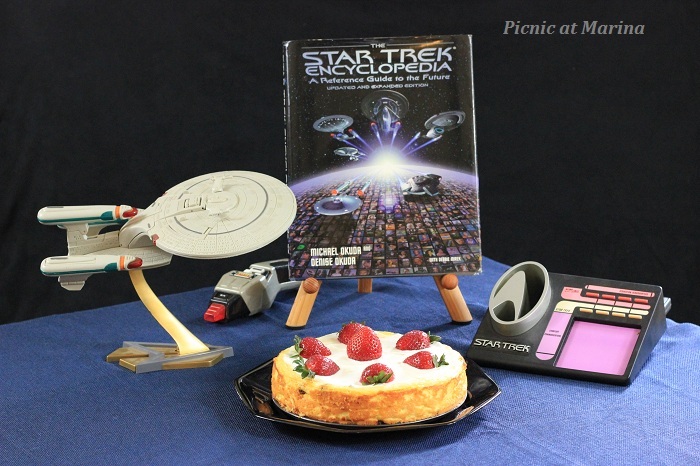 Star Trek: The Next Generation featured Captain Jean Luc Picard leading his crew on a seven year mission which was broadcast between 1987 and 1994, with summer breaks for eating cheesecake. The Borg are bad guys in the Star Trek universe, assimilating entire species into their collective. Their blend of advanced cybernetics and organic life forms presents an almost unstoppable force. They declare to those facing assimilation that Resistance is Futile, but they occasionally discover that it is not. 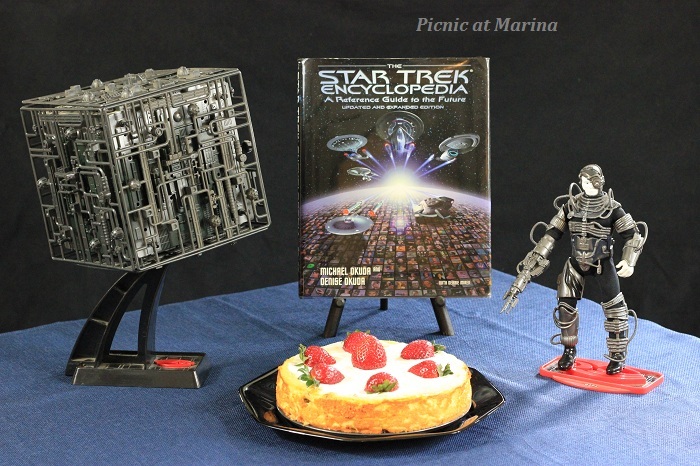 We encourage you to resist assimilation by the Borg, and prepare to assimilate some cheesecake. You'll be glad you did. We had hard to describe fun working on this post, and after taking 157 photos we praised ourselves by a cup of tea with the cake, making of which (the cake) was a science experience by itself. Enjoy the movie, and come back tomorrow for the cake recipe! P.S. We are moving to Washington State. I've been packing, packing, and don't see the end of things that needs to go in boxes. Container will be here next Friday. Teenager graduation in on Thursday. I also have several other events to attend. With all that said, my posts will be sporadic for the time being, until we move and settle somewhere. I also may not be visiting your lovely blogs as often as I'd like to. But I think of you all often. 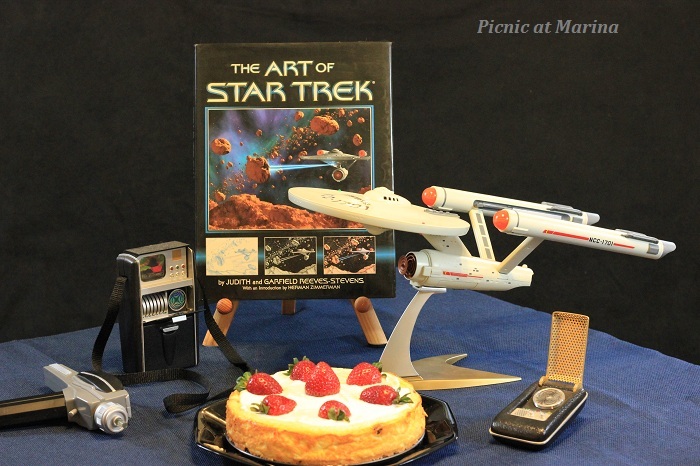 Lovely display and photography, Star Trek is brilliant! Mm cake. Was there borg in the original series? Thanks for your comment. Bryan answered your question below. Just 2 weeks ago, I went to a theater to see the two-part, Next Generation episode "The Best of Both Worlds". This post is singing my song! I'll be back for the cake recipe. Fun stuff! Great pictures! And I'll bet the cake was delish. ;-) Thanks for this. So here's a question Bryan - who was your favourite Star Trek captain? For me, Picard, without a doubt! Hi Charles, thanks for your comment. See the answer to your question from Bryan below. The Borg were not present in the original series from the 1960's, but were introduced in the Next Generation in the 1980's. The final series produced was Enterprise, which according to the Star Trek timeline happened over 200 years prior to the introduction of the Borg in Star Trek The Next Generation. One episode from Enterprise featured the discovery of crashed Borg Ship on Earth, but this created some tricky situations with continuity. Captain Kirk and crew never directly encountered the Borg in their timeline. My ultimate favorite Captain is Picard, primarily because of the refined wisdom and maturity of the character. Kirk was the guns-a-blazin' captain, and since my first Star Trek experience was with the original series, he also holds a high place in my Trek appreciation. Trivia- the second photo shows the Enterprise NCC-1701D with THREE nacelles. This ship was from an alternate timeline, and the one primarily used in The Next Generation had only two nacelles. Anyone catch that? I am a big fan of Next Generation! Love the show!